World-class, ProCalV5 solutions are backed by a comprehensive range of professional support services. Programs are designed to maximize your investment, complement your organizational structure and meet your specific objectives. From day 1 planning through complete system life cycle, you can count on Prime Technologies for the most reliable, professional customer experience and services. More than a software development company, Prime Technologies offers assistance to implement your new FDA/ISO compliant calibration management solution for large or small businesses. Our professional team of ProCal experts has the experience and training needed to guide your project to success in accordance with FDA and ISO guidelines. 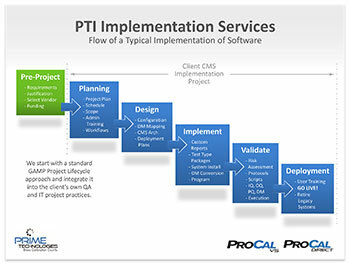 Click the image above to view a typical implementation flow. A successful project has clearly defined objectives, assigned tasks, a realistic achievable plan and effective management. We can provide managers and any level of support staff to make certain that your deployment is delivered on time and with the most cost effective strategies. In addition, our vast library of planning, testing and reporting documents are designed to meet the highest standards for FDA, ISO and other regulatory compliance requirements. 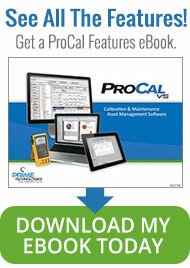 Significant improvements in efficiency and quality management can be achieved with ProCalV5 software. In many cases, return on investment is almost immediate. Systems experts are available to help your administrator with the development of effective configuration and work flow practices. Training can be customized to your needs and classes can be scheduled at your facility, via the web, or at our training center in Exton, PA. ProCalV5 experts are available for both administrator and user training. Typical Work Shops include professional guidance for system work flow configuration, end-user assignments and master asset record creation. As defined in our quality system, each version of ProCalV5 is validated before release following current GAMP guidelines. Prime Technologies development and testing policies have been audited and approved by many of the largest Life Sciences companies. Detailed validation scripts are available in both non-executed (MS Word) and executed (.pdf) packages. Make maximum use of the best of breed solutions your company has in place now with ProCal software. Our Data Exchange Utility and ProCal Connector offer a convenient interface allowing calibration data and records to be shared with other applications. Integration to SAP, CCMS and other platforms is possible, and we have the IT professionals who can help. When replacing older legacy applications, most ProCalV5 projects require that historical data be migrated. Our software engineers have extensive experience, powerful software tools and proven test methods that guarantee successful results. Data mapping is a customary service that we provide to our clients when they move on from older software applications. Older systems typically have a less concise data structure. Moving to ProCalV5 gives you tighter control of your information and upward compatibility to future releases. Verification tools and testing is a normal practice with this service. 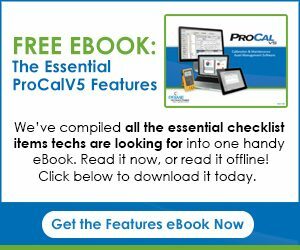 Each version of ProCalV5 includes over eighty standard reports ranging from customary scheduling and calibration certificates to statistical management reviews. New reports can be added and existing ones modified using Crystal Reports. Reports can be created and made specific to individual accounts within ProCalV5. ProCalV5 offers a powerful and flexible user interface that is configurable to a wide range of instruments, systems and devices. In many cases, specific equipment requires specific tests outside the common format. Some examples are analytical lab equipment, HEPA filter certification, quad testing of scales & balances, pipette certification, etc. In such cases, specific fields, routines and algorithms may be needed. Many “Test Type Packages” (TTP) with accompanying reports have been developed for ProCalV5 and the library of those available keeps growing. These unique modules are individually developed and validated. They snap into the main application. Please call if you have needs for specific test packages. When implementing calibration software, your organization begins developing a crucial partnership with the software vendor of choice. In order to reduce time and costs, and still manage your day to day operations, organizations need to be able to rely on its software vendor. In the past 20+ years, Prime Technologies has developed and earned the trust and reliability of its growing customer base. We believe that providing the highest quality support and maintenance to your system is invaluable. Copyright © 2019 Calibration Management Software – CMS – ProCalV5. All rights reserved.